Ingredients: organic cleavers herb, organic sarsaparilla root, organic ginger root, organic licorice root, organic star anise, organic galangal root, organic cardamom, organic orange peel, organic black pepper, and organic cloves. 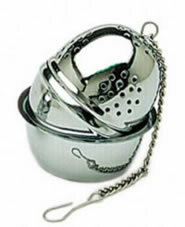 Ingredients: stainless steel infuser with tray. Ingredients: organic cleavers herb, organic blue violet herb, organic ginger root, organic licorice root, organic star anise, organic galangal root, organic cardamom, organic orange peel, organic black pepper, and organic cloves. An authentic, rich and spicy blend, which has been a mainstay in northern India for centuries. After brewing, add milk or a milk substitute and sweetener to create an exquisite taste that is delightfully unique to chai. Ingredients: organic cinnamon bark, organic cardamom seed, organic ginger root and organic clove buds mixed with organic Assam black tea plus natural essential oils of cinnamon, cardamom, and ginger. Wrap yourself in the soothing comfort of Yogi cold season teas. Choose from among four different formulas to help protect you and the ones you love: contains four each of Yogi Breath Deep Tea, Yogi Echinacea Immune Support Tea, Yogi Cold Season Tea and Yogi Throat Comfort Tea. Ingredients: four each of the following blends, all certified organic: Breathe Deep â€” Respiratory Support, Cold Season â€” Nasal and Bronchial Aid, Echinacea Immune Support â€” Immune System Boost, Throat Comfort â€” Throat Health Support.